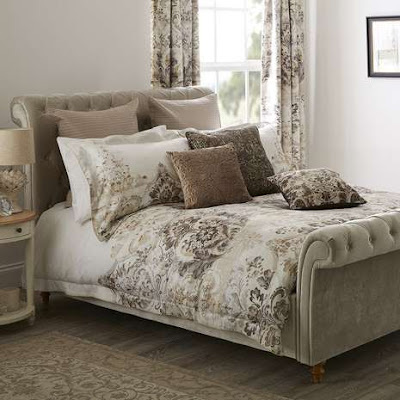 If you’re looking for co-ordinating opulent bedding which will transform your bedroom adding texture, pattern and bold rich colours then your bed needs Dorma. 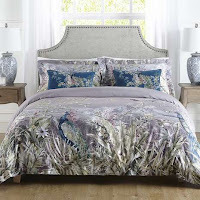 This bedding range is one of the many hidden gems at Dunelm, it also has co-ordinating accessories from curtains to furniture to give your whole room a makeover. Intertwining nautical ropes trail endlessly over an oceanic navy blue ground with a striped reverse in this Dorma Resort duvet cover, which is crafted from sumptuous 100% cotton for ultimate comfort while you sleep. Featuring a silver metallic piped edge and zipper fastening, this stylish printed duvet cover can be paired effortlessly with coordinating curtains and ornate embroidered accessories to create the perfect nautical inspired bedroom. Dorma Ottoman's stunning jacquard design features raised trailing ornamental flowers and leaves amongst intertwining ogee shapes. This luxurious duvet cover is crafted from a blend of polycotton and has a concealed zip fastening. Machine washable for easy care and available in a variety of sizes, you can complete the look with coordinating curtains and accessories.